To start creating leads, go to the Sales drop down menu and click on Leads. Click on the New button to create a lead. Set the Owner of the lead - this is the person who is primarily responsible for the relationship with this lead. Add a Telephone, Cell Phone and Email. Select the Industry in which your lead is working. New - Used for a new led, with which no contact has been made and no action has been taken in relation to it. Open - When you click on a Lead to view it, its status changes to Open. This is a good way for you to know whether anyone in your team has viewed the lead. This status is used for a valid, active lead; on which action has been taken (e.g. the lead has been viewed: contact has been made, etc). Converted/Accepted - Represents a lead that has been converted into an Opportunity. Dead/Rejected - Means that the lead cannot be converted / is a dead lead. Select the Dead Reason - If the lead cannot be converted, here is where you can specify why. Enter the Location which your lead has opted for. Set the Client Type within which you believe this lead will fit into. Set the space Size required by your lead. The size is in either square feet or meters, depending on how your location has been configured. Add the Number of People that your lead needs to accommodate. If there is a Location Required by your lead (e.g. : floor, position within the building), you can enter it here as well. Add any Timing related information: e.g. : when they plan to move in. Enter the required Space Type - e.g. : office or meeting room. Add the Quality of the Space. This section is particularly used with automatically incoming leads from LeadDADI, to display the original email message that triggered the lead. Therefore, this section is not editable and is only used for you to be able to view the initial message sent by the prospective customer. Select your Broker from the list. The broker needs to have been added to the system already (via the Accounts module). You can click the “+” sign next to the dropdown to create the broker right away. Select the Broker Contact - Once again, the contact needs to be already present in the system or created using the corresponding “+” sign. Read more about adding contacts to Operate. Enter the broker’s Email address. Enter a Broker Reference text if required. To make changes to an existing lead, go to Sales > Leads and select your lead by clicking the company name in the list. If you cannot find your lead quickly, use the Filter box at the top right to search for a keyword. This will take you to the lead details page, where you can select Actions > Edit to be able to update your lead. 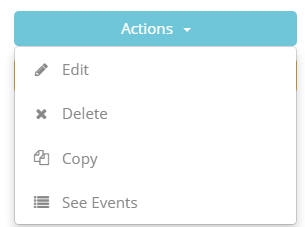 To delete a lead, you can select Actions > Delete, on the same details screen. The Actions > Copy option will create a copy of the lead, to which you can make small adjustments and create a new lead easier (it automatically fills in the information for you). To update the stage of the lead, click Update Stage in the options menu on the right. You can set the ead as New, Open or Converted.